If there’s one article I’ve linked to internally more than any other since starting this blog, it would definitely be this piece on Hampshire College. Part of this is due to the fact that Divest This got started in reaction to the (false) story that Hampshire College had become “the first US college to divest in Israel” in early 2009. More specifically, it started as a reaction to the attempted rekindling of a BDS tactic that had been dormant for several years before the Hampshire story put it back into play. Hampshire was also the original BDS hoax which led to several similar frauds during the three years since then (most of which consisted of attempts to pass off generic business decisions by third parties as being examples of politically motivated divestment choices targeting the Jewish state). So whenever a new boycott hoax broke out, it was easy to reach for Hampshire as the Ur-example of BDS dishonesty and excess. Well Hampshire College’s investment portfolio is back in the news (or at least in my friend Jim Wald’s blog). After some discussion and debate, the school revealed a new policy regarding socially responsible investment which it declares to be the most rigorous in the country. While the critical thinker in me has questions regarding what measurement is used to test the rigor of ethics, regarding the politics of the new policy the college seems to have come up with a way to balance its need to be socially responsible with the need to avoid the irresponsibility of certain parties it had to deal with two and a half years back. Now some people have pointed out that the new policy does provide the local Students for Justice in Palestine (SJP) group an opening, given that the criteria it specifies for considering an investment/divestment target as “controversial” involves taking into account the opinion of a number of institutions that have long since been co-opted by the Palestine-uber-alles brigade (such as the UN or human rights NGOS) as well as reports in the media (which we all know bend over backwards to double check every story coming from the Middle East to guard against inaccuracy and bias). But these potential loopholes (which are pretty minor and manageable, especially with grownups in the cockpit of decision-making), create a much bigger dilemma for the SJP types than they do for Israel’s defenders. After all, SJPers have just two choices now that the new guidelines have been published: (1) don’t appeal to the school to place Israel-related companies on the Hampshire blacklist (which means Hampshire divestment won’t be an issue for anyone) or (2) do make such an appeal and ask the school to apply the new guidelines and divest from Israel. The trouble (for them anyway) is that SJP has spent the last two and a half years announcing that Hampshire College has already divested from the Jewish state. And they didn’t just make this claim once a few years back. 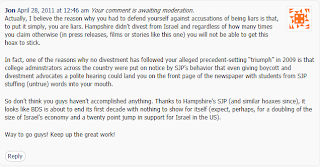 Rather, in press releases, conferences, speaking gigs, and even a movie, they have celebrated over and over their “success” in getting Hampshire to become “the first US college to divest from Israel.” So if they now go back to that same administration and ask them to actually do what SJP just pretended they did in 2009, that would represent nothing less than an outright admission of what we already know: that SJP lied about Hampshire’s action in 2009 and has been lying about it ever since. 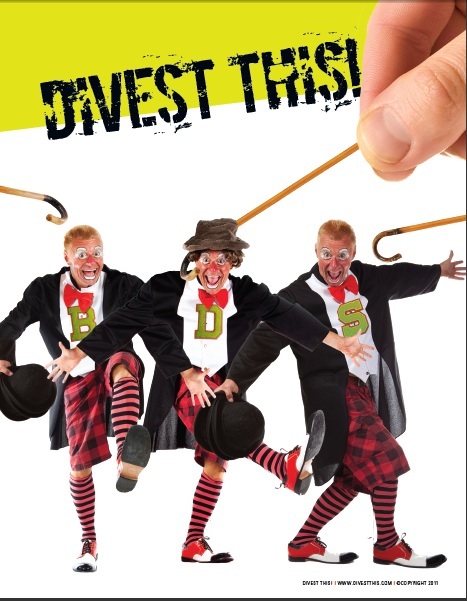 There is precedent (TIAA-CREF) where the BDS “movement” made a false claim about an alleged divesting institution one year and then appealed to that same institution to actually divest the year afterwards. But in the case of TIAA-CREF, it was the boycotters original hoax that got dumped down the memory hole before they began a multi-year (so-far failing) campaign to get CREF to actually do what the boycotters just faked they did previously. 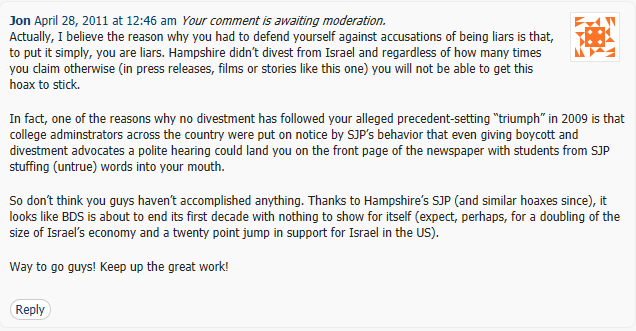 In the case of Hampshire’s, however, the only reason SJP is on the map (and has become the focal point of campus anti-Israel activity for the last several years) is because of their claims that they succeeded in getting a school to actually divest. If they now go back to the administration with new divestment demands, that would constitute nothing less than a full admission that they have been lying to everyone for two years, something that needs to be taken into account when evaluating any claim about any subject made by this group (or any other BDS organization for that matter). Uh-Oh. The Brain has hatched another scheme?? ?